First things first, I am OBSESSED with ketchup. There are many foods that I eat that I don't particularly care for (eggs), yet I eat them only as a form of a ketchup delivery system. Not only do I put ketchup on my eggs (and lots of it), I use it outside of the norm in other ways too. I use ketchup as a dip for fried chicken, put it on crackers and chips, put it on spaghetti (admittedly, I took this idea from the movie Goodfellas), put it on vegetables, etc. Basically, I'll put it on anything, although I've never put it on ice cream, nor do I think I ever will. That said, when I saw that Walden Farms offered a sugar free and zero calorie version of Tomato Ketchup, I said that I had to give it a try. I knew I was playing with fire with this one, but hey, I'll try just about anything. I picked up this twelve ounce container for $3.69 at Kroger, by the way. So, with a sense of terror in my mind fearing how my beloved ketchup could be ruined, I plodded on. Pouring this out onto my spoon, I was struck by two things. The first was that this was especially runny, but I kind of expected that having dealt with Walden Farms products before. The second thing was that it reeked of vinegar with a very slight tomato smell. Again, kind of expected that since this is not my first Walden Farms rodeo (or review). The only other physical observation that I can make was that it was red. So, mark one in the win column for Walden Farms...they've successfully matched the color of tomato ketchup. Ha! Anyway, the ingredients here say that this one is made with tomatoes, onion, garlic, Worchester sauce and freshly ground herbs. Basically, that means that they've taken all those things and reduced them down to powders to mix in with the vinegar and triple filtered purified water, just like they do with all their products. As I put this in my mouth, I said a silent prayer hoping for the best and well, let's just say the best did not happen. I could taste the onions and the garlic in here and they provided a strong bite to the ketchup, but the tomato flavor did not really hit to the end. All I tasted was some sort of acidic liquid that nearly made me want to throw up. What tomato flavor there was tastes overwhelmingly artificial and disgusting. somewhat spicy taste. Actually, the more that I think about this as I type the review, the more I want to hurl RIGHT NOW. It was that bad. What was even more terrifying was that I put my spoon down afterwards and then grabbed it later, there was almost an acid-like burn left on the spoon from the remnants of this. Buy It or Fly By It? 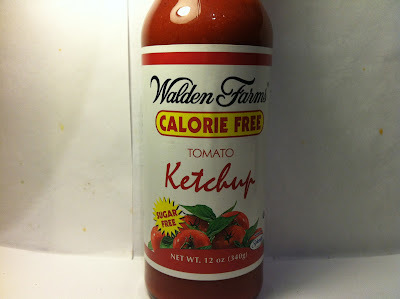 Ordinarily, I'm willing to look past some deficiencies as they relate to Walden Farms products because these deficiencies contribute to the greater good (zero calories), but in this case, I just can't do it. This product gets a strong FLY BY IT rating. It's an insult to my beloved ketchup and what saddens me is that I've got an entire jar minus one spoonful left to finish since I refuse to just throw this out and waste it ("waste not, want not" was the motto I was taught growing up). Hopefully this has got an expiration date of 2016 or later, because it might take me that long to finish this horrible representation of my beloved ketchup. I am glad you posted this review. I have been considering buying this ketchup for a long time. But I rarely use plain ketchup...I usually use salsa or a BBQ sauce. The walden farms BBQ sauce is pretty good (except for the honey one) , and I use it like you use ketchup. It's is great on a "cheese burger" pizza, which I made last week for dinner. The smoke BBQ sauce is my favorite flavor so far, but I have not tired the original version yet. The thick and spicy is ok, but the honey is crummy. I've actually had the original barbecue sauce (review will be coming in the future; it's in queue) and also the Thick 'N Spicy (reviewed at wouldibuyitagain.com) and liked both. Never had the honey one though. Ketchup is already so low calorie, that I don't think this product is worth it even if it actually did taste good. Jack, ordinarily ketchup is low calorie, but when you drench things in it and eat it in the quantities that I do, it ceases to be low calorie and starts to become gluttonous. That's why I was so willing to try this out. Based on my review, I obviously wish I hadn't. By the way, I've reviewed a lot of those Walden Farms products here on the blog (and there will be more coming) so make sure you keep coming back! Thanks! I too adore ketchup! I tried this quite some time ago and could not believe how bad it was. I actually did throw mine away even though it's very wasteful. I knew there was no way I could ever choke it down. I do like many of the Walden Farms dressings though. Just wish the stuff were not so expensive! Reduced sugar heinz is pretty good and I believe it's only 5 calories per tablespoon if you're looking for a lower calorie option than normal ketchup. Use it up by mixing it in meatloaf or burgers...after it's cooked, you'll forget it's even there, and you won't have to waste it! Good idea, but I'm even afraid this putrid mess would screw those up! I have had this and repurchased it several times, and I like it. However, I don't love ketchup as much as you. So for those that aren't that picky, you might not find it so bad. I recommend giving it a try. I wish I had read this review before I wasted almost 4 bucks. I agree, it was horrible. 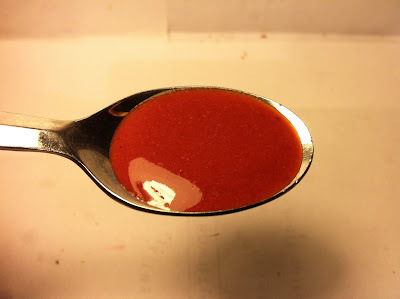 I am on a low carb diet and I was able to use some of it to make a barbeque sauce (lo-carb). I did purchase the heintz low sugar for my omelettes and I love it....taste like ketchup should.